Lubricant performance can vary greatly between competing mineral and competing synthetic oils. Because these quality differences directly and significantly impact the ultimate coast of operating and maintaining the rotating equipment, lubricant purchases can not be effectively managed as a commodity. Lubricant excellence must always be purchased, for even the most effective lubricant management practices cannot impart properties to a lubricant that it doesn’t posses. Royal Purple lubricants consistently deliver a higher level of performances across a broader group of equipment than other industrial oils, including the synthetic oils offered by our largest competitors. No other lubricant offers a lower Total Cost of Ownership for the majority of your plant equipment. The cost reductions consistently exceed the total cost of the product, often within a few weeks as illustrated by the examples to the right. ● Example is based on 36,000 HP ( electrically driven ) operating 8,000 hours per year @$0.05 kwh power cost. ● Lubricant purchases are 3% of the maintenance costs. 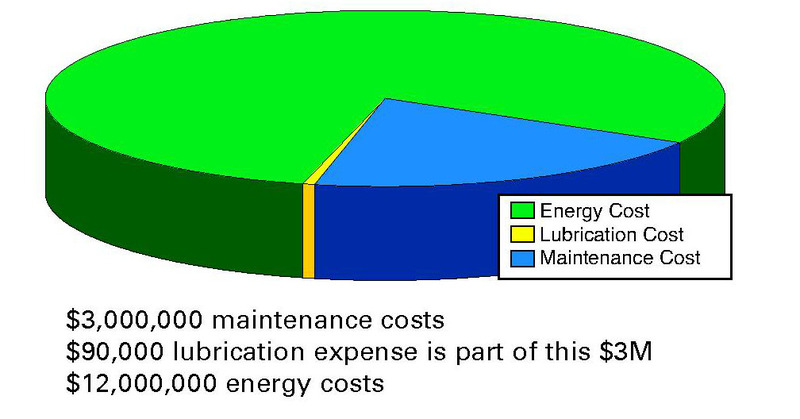 ● Lubricant purchases are 3/4% of the energy costs. ● Though conceptually accurate, expense ratios will vary from plant to plant. Rotating Equipment Cost Savings using Royal Purple. The following pie chard illustrates the savings attainable across a broad population of equipment from upgrading to Royal Purple lubricants. ● Though Royal Purple lubricants may cost more per gallon, the annual cost for lubricant changes little dude to greatly extended drain intervals and the elimination of oil changes associated with equipment repairs. ● Even a total elimination of current lubricant costs would product insignificant savings compared to the savings routinely attained from upgrading to Royal Purple lubricants. Most cost savings initiatives intended to reduce maintenance costs and improve rotating equipment reliability are very time and people intensive. Royal Purple in Saraland, Alabama offers significant improvements and cost savings by simply replacing a product you already buy and use. It doesn’t get any easier than this. Your current supplier is delivering the message you want to hear . . . That the best value is attained by maintaining tradition and purchasing major brand quality at competitive prices, often with the opportunity to further reduce purchase costs by consolidating your purchases. Royal Purple is delivering the message that its lubricants produce savings that dwarf your total expenditure for lubricants. Both of us can’t be right. And while a part of you would like to believe these savings are possible, it just doesn’t make seem plausible that they can be achieved by just changing lubricants. The primary job of a lubricant is to reduce friction and protect lubricated components ( energy & wear ). Most rotating equipment repairs are due to the failure of lubricated components, mainly bearings. 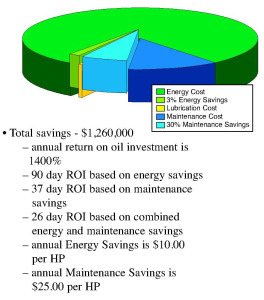 Therefore, it makes perfect sense that truly superior lubrication will deliver energy and maintenance savings. When your current supplier learns that you are considering any use of Royal Purple lubricants, expect them to reinforce your doubts. You will hear how large their research departments are and that a smaller company couldn’t possibly offer better products. You will be shown carefully selected laboratory tests intended to clearly show their products to be technologically superior. Every means will be exerted to prevent a head-to-head comparison with Royal Purple at the equipment level, where the outcome is already known to them. They would have you continue to make, without all of the facts, a decision that falls within your comfort zone.